A Celebration of Life service for Iris Cynthia(Binford) Henderson age 92 of Covington, will be 10 am Wednesday, November 22, 2017 at the Covington United Methodist Church with Rev. Kim Giles officiating. Burial will follow in Covington Cemetery under the direction of Ladusau-Evans Funeral Home. The family will receive friends Tuesday evening from 5:00 to 6:00 pm at the funeral home. Iris Cynthia (Binford) Henderson was born September 7, 1925 in Montgomery County, Texas to Della Charlotte (Heaton) Binford and William Lallas (Bill) Binford, the eighth of eleven children, and passed away Sunday, November 19, 2017 in Enid, Oklahoma. She attended public schools in Montgomery, Texas, graduating high school in 1941. She then moved to Houston where she worked at various jobs before moving to Mooreland, Oklahoma in 1946 to help her oldest sister Rachael Erickson. It was there that Iris met Marion Eugene Henderson and they were married at the First Methodist Church in Mooreland on August 1, 1947. They were married sixty-eight years before Gene passed away in June of 2016.Shortly after their marriage; they traveled to Stillwater, Oklahoma where Gene completed his degree in Agriculture Education. He was employed by the Amorita Public Schools, where they lived while he served as the agriculture teacher. While there, their first child, Jeffery Eugene Henderson was born in the Cherokee Hospital. They then moved to Gene's hometown, Mooreland, Oklahoma where he assisted his parents, Marion and Edna Henderson in the local Henderson Store. While there, their second child, Jennifer Marion Henderson was born in the Mooreland Hospital. In 1953, the family of four moved to Covington, Oklahoma, where Gene was employed as Agriculture Instructor and where Iris and Gene made their home for the next sixty-three years. During their time in Covington, Joel Brent Henderson and James Brian Henderson were added to the family. 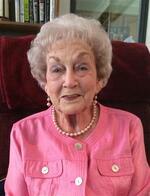 Iris was an active member of the Covington United Methodist Church. She was a longtime member of the Order of the Eastern Star. She worked at the First State Bank of Covington for twenty-three years, serving as the insurance and financial secretary to the bank president. In 1988, Iris retired from her position as bank secretary and she and Gene enjoyed traveling with family and having numerous families “get-to-gethers".She was preceded in death by her husband, Gene in 2016: her parents, three brothers, Pierce (Son) Binford, S.T. (Bud) Binford and Douglas (Peter) Binford; three sisters, Rachel Erickson, Julia Richards, and Irma Cockrill, and her beloved grandson, Conor Henderson. She is survived by her children: Jeff Henderson and wife, Angie of Oklahoma City; Jennifer Hart and husband, Steve, of Enid; Brent Henderson and wife Cheri of Kingfisher; and Brian Henderson and wife Carla also of Kingfisher. She was blessed with eleven grandchildren, Conor, Parker, Jenelle, Jesse, Joshua, Adam, Erin, Drew, Regan, Tiffany, and Steven, and sixteen great grandchildren. She was also survived by four sisters: Jean Johnson of WestPoint, TX, Beth Stevens of Willis, TX, Billye Smith of Magnolia, TX, and Velma Rothrock of Tomball, TX. She is also survived by two sisters-in-law, Eleanor Starcher, Arvada, CO, and Lorna Sue Henderson of Prairie Village, KS and many nephews, nieces, cousins and many friends. The family extends much appreciation to Sharon Fisher, the many care givers at the Commons Methodist Center, and the wonderful doctors and nurses that contributed to her care. The family asks that in lieu of flowers, that donation be made in her memory to the United Methodist Church of Covington, or the Senior Citizens Organization of Covington, or a charity of your choice with Ladusau-Evans Funeral Home serving as custodian of the funds. To send flowers to the family of Iris C. Henderson (Binford), please visit our Heartfelt Sympathies Store.